Sparing you the discussion whether or not there are differences in sound with different caps, I simply begin with: “Yes, there are. Use your ears and you will find out”. 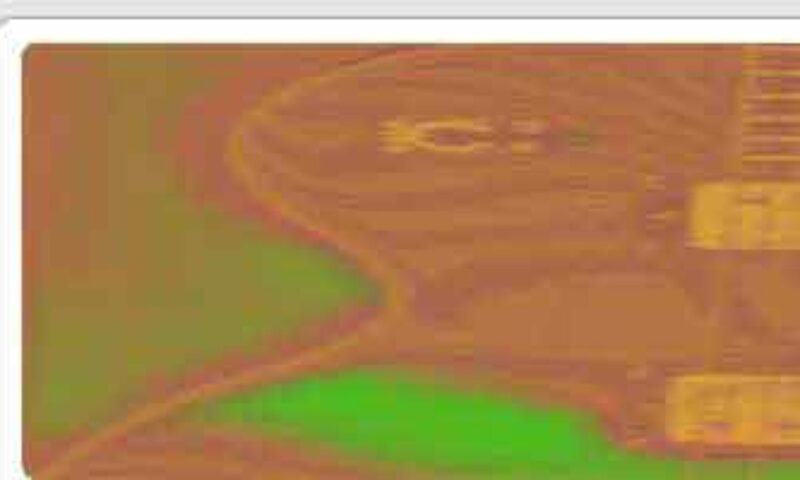 This post is to enlarge upon some former posts – when I still had no idea how many people would be interested – specially upon “switches and caps“, which is my no.1 post concerning hits now. There are some comments there with additional information, if you like. “Luxe Caps” (Vitamin Qs), made of Russian military caps, thoroughly coated to look like vintage caps. They are California made, but the link above is to a German distributor, where I bought a bunch of caps (I’m also German), being much more delighted with the sound quality than with their English on the home page. But there are some forums (just google “Luxe caps”) who talk about alternatives to these rather expensive parts. Or look here for NOS caps. – amongst them: Bumblebees. The legendary Les Paul caps give a nice and smooth sound, but for some it’s just too dull. – Black Beauties. Used later on in Les Pauls, they are a bit brighter in sound, and my favorites. Red Dimes, Orange Dimes (good ceramic caps, but still ceramic..) and many others. Personally, out of vintage repro caps, I prefer Black Beauties for all Les Pauls (including Juniors and Specials), for they give a brighter sound than Bumblebees. Both come in 0.022 uF only. There are intended as replacements for original vintage instruments. With little interest in “vintage correctness”, in a way I don’t care too much if they belong in this very guitar I want to tune. The point is: they sound very very good. Even the higher priced ones are worth trying. Capacitor Values: Values (in micro Farrad) differ from 0.01 to 0.1. The higher the value, the stronger will be the high frequency roll off. 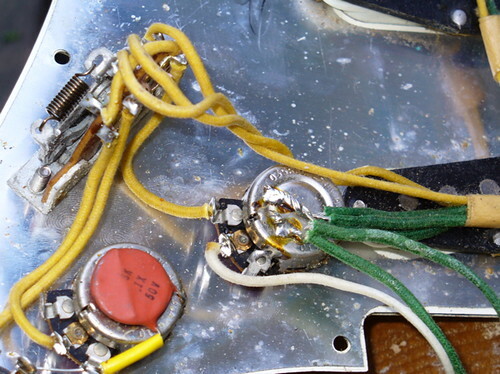 Fifities guitars often had bright sounding pickups – these were matched by more roll-off (0.05 to 0.1), whereas 0.022 is most common now. Vintage repro caps only come with vintage correct values, but it is worthwhile to experiment with different ones. In this case, you’ll have to try “normal” caps. I had a bass guitar that sounded somehow strangled until I fixed it with a foil cap of a different value – it felt like a miracle! For the Neck PU of my Les Paul I put a 0.033 uF cap so it lost its biting brightness, whereas for the bridge PU the usual 0.022 was fine. Jensens are high grade, but originally for HiFi. Rather big in size, they give a very cultivated, smooth sound. Except for my Gibson EB3 Bass, I missed some aggression, though. 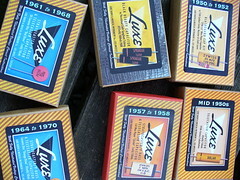 For my Stratocaster there was no alternative to a “chiclet” 0.1uF wax paper cap (Luxe). I originally wanted a red dime 0.05, like I had read somewhere, but after comparing it to a chiclet, there was no other way to go. I found the same to be the case with a student’s Mexican strat. These foil repro caps give the best and smoothest vintage sound I ever heard with Fender single coils. I don’t care if all the sixties’s strats were provided with ceramic caps – I would even replace these originals (of course keeping them). Styroflex also turned out fine, but I missed some of the character in tone that other foil caps delivered. 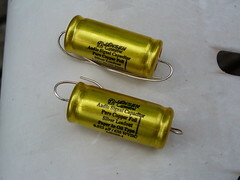 They are best for tone stacks in amplifiers (I already replaced some caps in my amps as well, with good results). 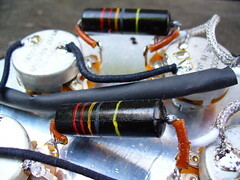 My Jaguar, as usual came with ceramic discs, but with the lower value of 0.01uF, as these single coils are rather different from a strat’s ones, and there are two tone circuits involved. So, no vintage repro caps were available. I simply tested several ceramic caps (for the main circuit), but bigger than discs, looking like the famous “Sprague” ones, and ended up with a 0.015. This one gave a fairly aggressive attack I liked so much that I don’t care I cannot turn the pot down anymore – not even a little bit, or it strangles both tone and volume. But after comparing its sound to the pot without any cap, I knew I couldn’t do without it. For the Jaguar’s “rhythm circuit” I took a different choice. This circuit was created for dull rhythm sounds with the neck pickup only – but I like to use it for smoother jazzy sounds. For lack of space I sought out an old foil cap from a British Quad amp called “Hunts”, looking like a tiny carrot or a candy, and at the same time decreased the value to 0.0056 uF (roughly, only half of the original value). The result was less dampening, so it served for soloing also.